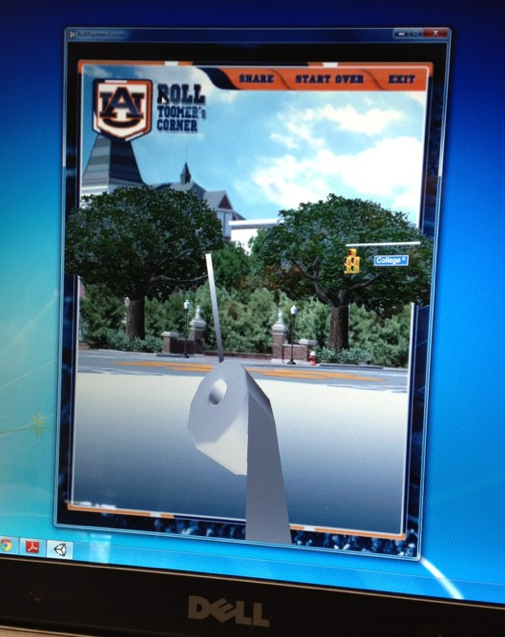 A screen shot of the Roll Toomer’s Corner app was released by developer Overtime Software in June. 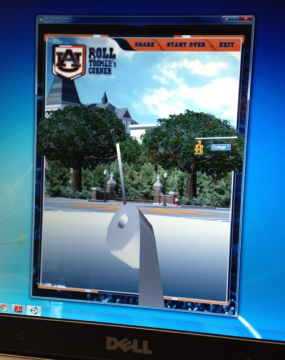 The Roll Toomer’s Corner iPad and iPhone app in development since May hasn’t been scrapped, just delayed. Originally slated for September, the app’s release has been pushed back due not to concerns over how it would be received in light of the oaks current condition but minor technical issues related to the app’s database, according to Brooke Bramlett, marketing director the app’s developer, who says Auburn fans will still be able to aim their smartrolls at oaks digitally restored to their pre-Updyke lushness. Though the game’s realism in terms of visuals, which feature not only the trees themselves but the Toomer’s Corner eagle statues, Biggin and Hargis Halls, and even the orange Tiger Paw in the intersection of College Street and Magnolia, will obviously be affected due to the recent pruning, Lady Cox, Chief of Staff for the Division of Student Affairs, which commissioned the app, says she still expects it to be well-received. “Our thought is that we’ll be able to capture it (the spirit of rolling the Toomer’s Oaks) digitally,” Cox said. Cox indicated that another, “greater” Auburn-themed app for students and fan is also currently in development. Related: ‘NCAA Football 14′ could include Tiger Walk, Toomer’s Corner features. Dumbest tradition in football. Guess there really is NOTHING to do in Auburn.